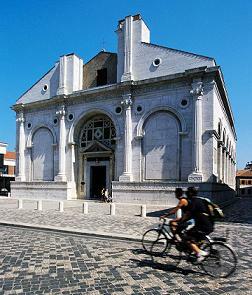 The Malatesta Temple rapresents the principle example of Reinaissance architecture in Rimini. It was commissioned by Sigismondo Pandolfo Malatesta in 1447. Under his reign Rimini became one of Italy's liveliest centres for learning and arts. The exterior part of the Temple is the work of the famous architect Leon Battista Alberti, while the interior was renowed by Matteo de'Pasti. Inside visitors may admire Giotto's Crucifix, frescoes by Piero della Francesca and reliefs by Agostino di Duccio. The works were interrupted in 1460 as a consequence of Sigismondo's declining fortunes and the church remained unfinished. In 1809 the Temple was dedicated to St. Columba and was promoted to the status of Cathedral. During the bombings that took place in 1943 the Temple suffered serious damage and the first restoration was done in 1950. The Temple, which was recently consacrated a Basilica (29 september 2002), underwent new restoration works financed by the Cassa di Risparmio di Rimini Foundation in Jubilee year. Its completion returned the marble and the colours of the interior chapels to their former splendour. The church closes an hour earlier for the rosary telling. on Sundays: from 9 to 10,30 and from 12 to 13 / from 15,30 to 16,30 and and from 18,30 to 19. Access for people in wheelchairs is on the left side of the main entrance, on the way through the gate into the garden of the Bishop house.